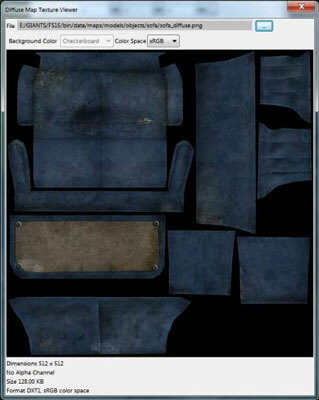 The Material panel gives you the ability to view and change textures on 3D objects in your Farming Simulator mod. This is particularly useful if you’ve converted the PNG texture images exported from your 3D modeling software to the recommended DirectDraw Surface (DDS) format and you need to point your mod to those new textures. Diffuse Texture Map: This is an image texture that defines variable diffuse colors over the surface of a 3D object. If you want to have more than one solid color over the surface of your 3D object, you want to use a diffuse texture rather than the simple flat diffuse color. Specular Texture Map: In its simplest form, the specular texture image isn’t full color. Instead, this grayscale image defines the material’s shininess. Lighter pixels define a shinier area whereas darker pixels stipulate a more matte surface. The latest version of GIANTS Engine supports a more complex type of specular texture. Normal Texture Map: You may wonder if the other textures are abnormal textures. That’s not quite the case. In fact, the normal texture is the strangest of the three major texture types. In 3D graphics, a normal is an imaginary line that projects perpendicular to the surface of a triangle. These normals are used to calculate how light reacts with the surface of the 3D object. If you can modify them, you can make some pretty dramatic changes to how light interacts with your material, which is exactly what normal maps do. Normal maps allow you to show the illusion of more surface detail (such as bumps and ridges) than is present in the object’s actual geometry. If you click on the ellipsis ( … ) button to the right of the text field, GIANTS Editor shows you a preview of the current texture and gives you the ability to search for a different texture image using a file browser interface.